We present two types of scoring the detections in an image: discrete score, and continuous score. Under the former criterion, if the ratio of the intersection of a detected region with an annotated face region is greater than 0.5, a score of 1 is assigned to the detected region, and 0 otherwise. On the other hand, for the second criterion, this ratio is used as the score for the detected region. Further details for the evaluation procedure can be found in the FDDB technical report. 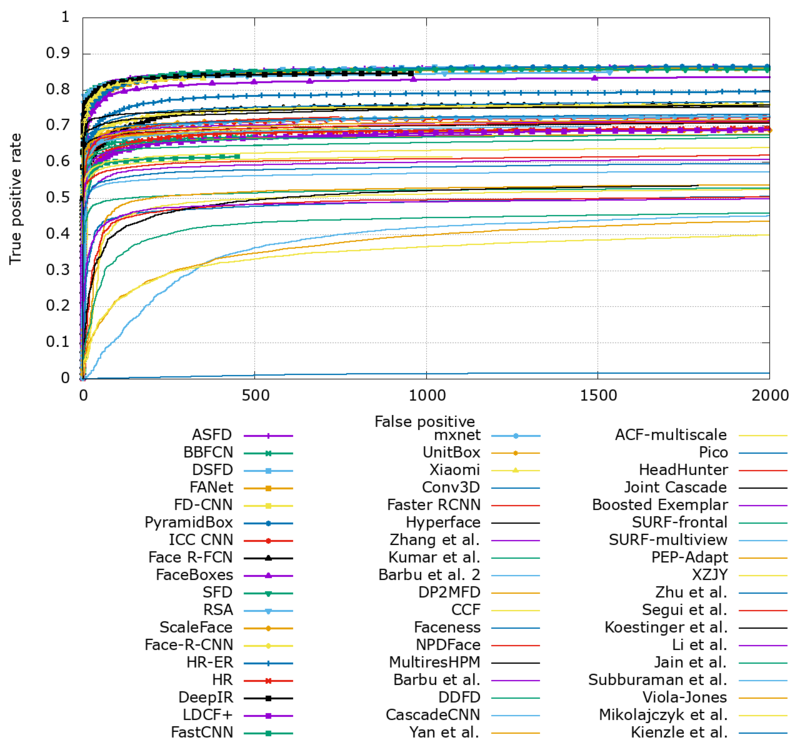 Code for matching detections and annotations and computing the resulting scores to generate the performance curves. The code has been successfully compiled and tested on Mac OS X, Linux, and Windows. Please check end of FAQ page for problems in running the evaluation code. Gnuplot scripts for generating the ROC curves are provided below. The latest results may not be updated always in the downloaded tar file. In that case, please copy the latest ROC curves individually into your local compareROC/rocCurves/ folder and re-run the plotting scripts. Please send the text files for the ROC curves to Aruni RoyChowdhury. See the Methods section below for sample output files. K. Mikolajczyk, C. Schmidt and A. Zisserman. Human detection based on a probabilistic assembly of robust part detectors. ECCV 2004. 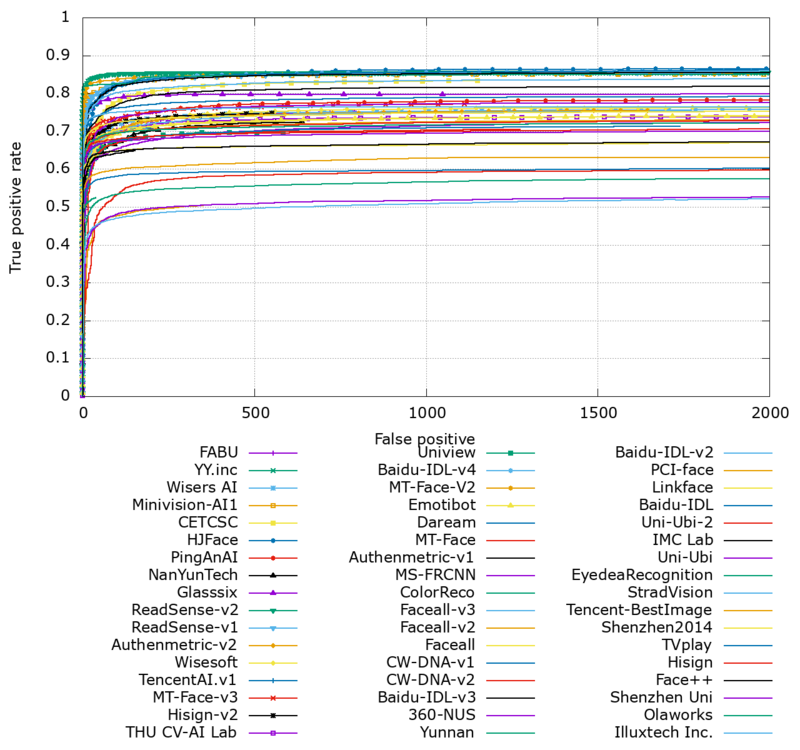 W. Kienzle, G. Bakir, M. Franz and B. Scholkopf Face Detection - Efficient and Rank Deficient. Advances in Neural Information Processing Systems, 2005. OpenCV implementation of Viola-Jones face detector. [ DiscROC, ContROC ] -- updated on June 7, 2010. B. Subburaman Venkatesh and S. Marcel. Fast Bounding Box Estimation based Face Detection. ECCV Workshop on Face Detection, 2010. V. Jain and E. Learned-Miller. 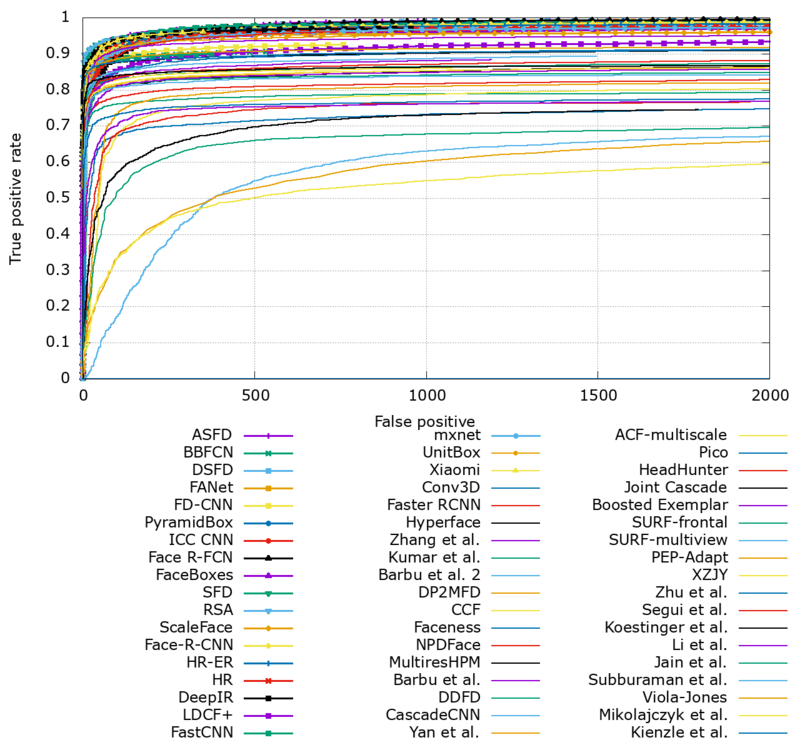 Online Domain Adaptation of a Pre-Trained Cascade of Classifiers. CVPR 2011. J. Li, T. Wang and Y. Zhang. Face Detection using SURF Cascade. ICCV 2011 BeFIT workshop. M. Koestinger, P. Wohlhart, P. M. Roth and H. Bischof. 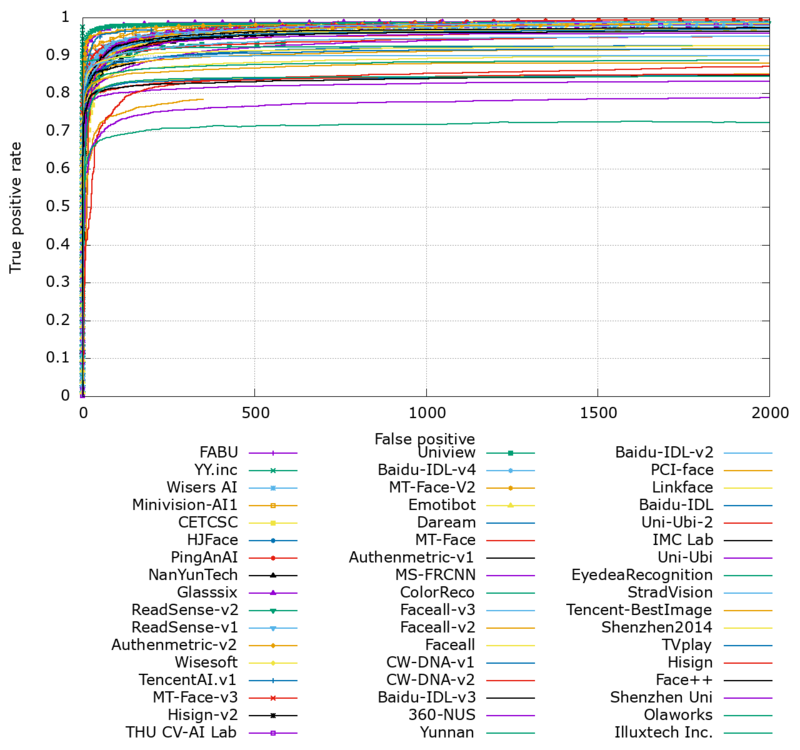 Robust Face Detection by Simple Means. DAGM 2012 CVAW workshop. S. Segui, M. Drozdzal, P. Radeva and J. Vitri. An Integrated Approach to Contextual Face Detection. ICPRAM 2012. J. Yan, Z. Lei, L. Wen and S. Z. Li. The Fastest Deformable Part Model for Object Detection. CVPR 2014. A. Barbu, N. Lay, G. Gramajo. Face Detection with a 3D Model. Vijay Kumar, Anoop Namboodiri, C V Jawahar. Visual Phrases for Exemplar Face Detection. IEEE International Conference on Computer Vision (ICCV), 2015. Kaipeng Zhang, Zhanpeng Zhang, Zhifeng Li. Joint Face Detection and Alignment using Multi-task Cascaded Convolutional Networks. IEEE Signal Processing Letters, vol. 23, no. 10, pp. 1499-1503, 2016.
a. System trained on external data. The face_p146_small.mat model provided by the authors was used to evaluate on FDDB. Shenzhen University frontal face detector. TVPlay.cn face detector -- Shenzhen TVPlay technology Co., Ltd..
Shenzhen University face detector (2014) by Shiqi Yu. Intelligent Media Computing (IMC) Laboratory, Sun Yat-Sen University [link]. Beijing Faceall Technology Co., Ltd. [link].